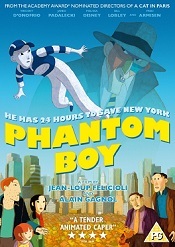 Phantom Boy is out on DVD on 13th February and to celebrate we have a great competition for you and 3 copies of the DVD to give away. Leo has a secret. A mysterious illness has transformed him into a phantom boy, able to leave the confines of his body and explore the city as a ghostly apparition. While in the hospital he befriends a New York City cop who has been injured while attempting to capture a gangster causing chaos across the city. They form an extraordinary duo, using Leo’s phantom powers and Alex’s detective work to foil the plot and save New York from destruction. From the Academy Award nominated directors of A Cat in Paris, a heart-thumping adventure that pushes their trademark visual style to literal new heights as Leo swoops and soars above the greatest skyline in the world. The voice cast includes Vincent D'Onofrio (Jurassic World), Jared Padalecki (Supernatural), and Fred Armisen (Saturday Night Live).